Mama calls it Sophie’s imagination, but Sophie calls it magic. Everything Sophie draws comes to life, and one day when Sophie feels lonely, she decides to draw a friend. But the polar bear cub isn’t very happy in Sophie’s room, where it is much too warm. So Sophie tries again. But the duck wants to swim in a pool full of water. And the giraffe is too tall for the tiny room! It isn’t long after the elephant shows up that things begin to get a little too wild and Sophie must demand that everyone go outside. In the backyard, with all her new friends, Sophie meets someone new—someone who happens to be an expert lion trainer. It looks like Sophie’s magic may have worked after all. Sophie's Animal Parade is an adorable book about a young girl named Sophie with a wild imagination. Everything Sophie draws comes to life. Sophie is lonely so she draws lots of animals and soon has a room full of animal friends. She ushers them all outside and once outside meets a little boy who loves animals just as much as she does. The little boy says he's a great lion tamer so of course Sophie draws him a lion to tame. Sophie and the little boy become friends over their love for animals and she is no longer lonely because she has a true friend. I like that the book teaches children that real relationships are what matter. My daughter has several imaginary friends so this book really hit home with her. The Illustrator has done a wonderful job of bringing this book to life with beautiful illustrations on every page. This is a wonderful book for children aged 3-5, however my 7 year old enjoyed this book every bit as much as my younger children. 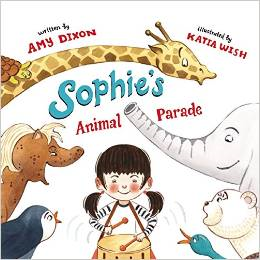 Sophie's Animal Parade can be purchased at B&N, Amazon and IndieBound.